Bicycle! Bicycle! : I'm On A Boat...cycle! I've noticed distinct patterns emerging in my wardrobe since I returned to bicycles. The most obvious being a sharp decrease in non stretch pants and corresponding increase in dresses for the freedom of movement they provide. (I said as much in my little bit of The Girls' Bicycle Handbook.) But another, quite literal pattern has been woven through this shift: A complete mania for stripes. Partly it's due to a proliferation of stripes in the shops but my stripes love has been building for some time, the increased availability has merely allowed me to target my obsession almost exclusively on navy blue and white horizontal, as though I were permanently about to board a yacht. 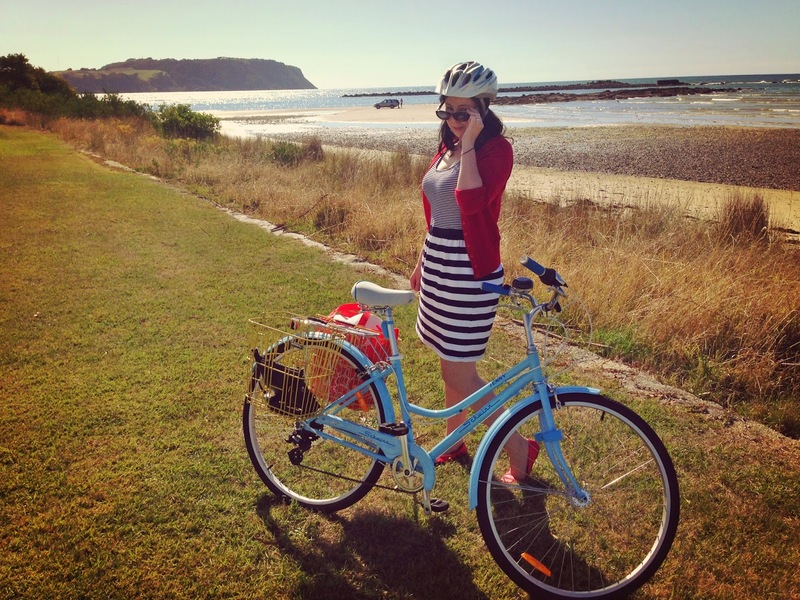 Blame suddenly living by the sea, blame the fact my 'best for summer biking' dress back in Perth was navy blue and white stretch cotton, blame my willing adherence to fashion. 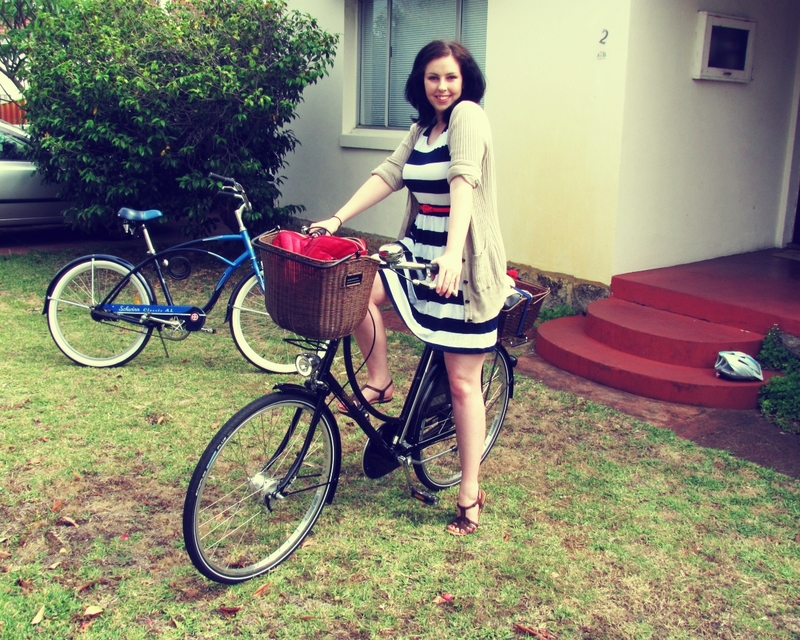 Blame what ever you like but something about stripes on a bike (Or on foot) makes me happy to be alive. Bike Stripes Genesis in Perth. Stretch 'T-Shirt' material dress from Target, perfect for sweaty, West Australian summers. I'm not a summertime fan but there's something of an endless summer feeling in navy stripes that I can still appreciate. Less of the sweat, swimsuits and sunburn, more of the blessed hour when the Perth sun finally relented and you could collapse into an outdoor chair with an iced drink, sea breeze and good friends around you. Plus it just makes me feel jaunty. Heavier cotton because sweat doesn't really happen in the summer here. Unwilling to let go of the feeling, I've now collected enough navy and white stripes to undertake one of those Capsule Wardrobe Projects and seasonally whittle my attire down to a core of striped items and things that go with stripes. Of course the majority of outfits have to be suitably 'bikeable'. The great thing about Autumn/Winter in Tasmania is that all I really have to do is add tights and some outerwear to all my Spring/Summer outfits. Not that this fact prevented me from buying a third navy and white striped dress. 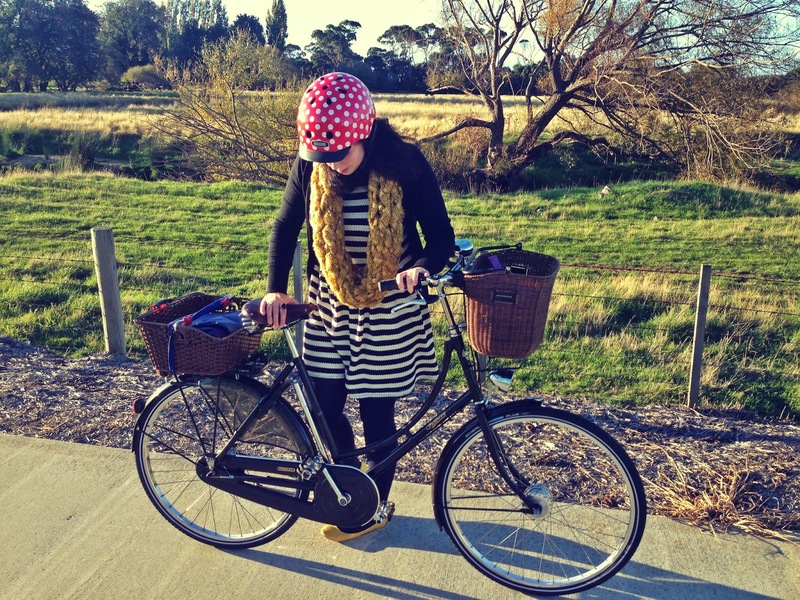 When I combine stripes with the polka-dotted Nutcase helmet, I feel like I'm radiating happiness everywhere I ride. I also feel a lot more visible in all weathers. I'll be quite sad when stripes disappear from the fashion landscape. It has been so much fun browsing through your blog and I'm just sad that I seem to have discovered it after you stopped writing entries. I hope you're still having bicycle adventures and that, maybe, you'll be inspired to come back here to write about them one day. I'm adding your blog to my reader just in case.